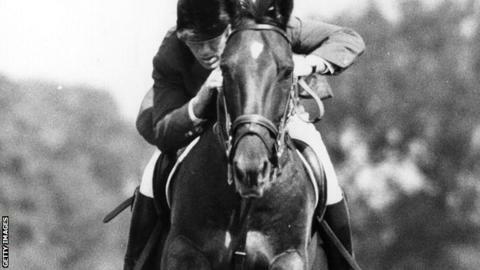 David Broome won show jumping bronze medals at the Rome and Mexico Olympics. Show jumping legend David Broome has paid tribute to triple Olympic gold-medallist Richard Meade, who died on Friday. Monmouth-born Meade won three-day event gold medals in Mexico 1968 and Munich in 1972. Fellow Welshman Broome - himself a double Olympic bronze medallist - said equestrianism had lost a great servant. "He was a true gentleman who could walk with kings and still keep a common touch," said Broome on BBC Radio Wales. Meade, aged 76, had been receiving cancer treatment since being diagnosed in October. In addition to his Olympic gold medals, he was a member of British teams that won the World Championship in 1970 and 1982 and three European titles. He was also named the BBC Cymru Wales Sports Personality of the Year in 1972. Broome said Meade was the leading light in a golden age for British three-day eventing. "In the late 1960s and early 1970s in three day eventing Britain ruled absolutely supreme, and Richard was the top man," added Broome. "His CV was second to none in any sport. Nobody's ever done better. He was phenomenal at his sport the record shows that. "Richard was a dedicated horseman, a wonderful person, great fun and a proper true gentleman I must say. "It was a testament to him really that he never dwelt on his gold medals - he just lived his life very quietly and did his bit for the sport and for that the eventing world should be truly grateful." In addition to his success with British teams at world, Olympic and European level, Meade also enjoyed individual success, winning at Badminton in 1970 and 1982 and the Burghley horse trial in 1964. After retiring from the sport he later served as president of the British Equestrian Federation and was chairman of the British Horse Society. His son, Harry, won a World Championship team silver medal in 2014. "Even when he retired Richard stayed very true to the sport and went into committees and served the sport honourably for many years," added Broome.